The Neo4jQuery executes a Cypher statement and returns its results. All properties can also be passed as parameters via an incoming trigger. To do so, include a property key on the incoming trigger with a $ or # as a prefix. Occurrence: When the Neo4jQuery function executes successfully,. When you run this example, the MyQuery1 returns a list of labels and counts in MyTable1. When you click on a row with a count < 5, it displays the nodes in MyNetworkView. Otherwise, a list of names is displayed in MyTable2. 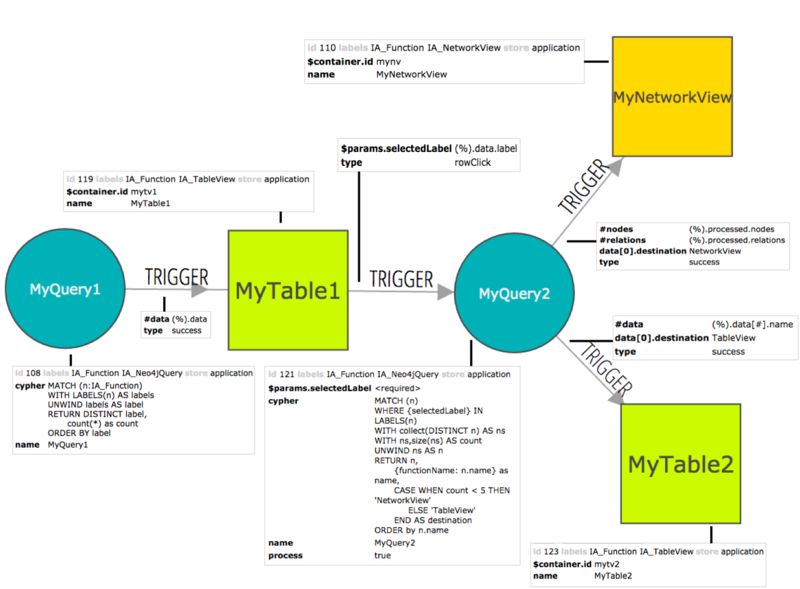 The first IA:Neo4jQuery node MyQuery1, has a type:success trigger that tp the IA:TableView node MyTable1. The trigger maps the (%).data element of the event data of the success event to the #data property of MyTable1. MyTable1 has a type:rowClick trigger to a IA:Neo4jQuery MyQuery2. This tigger maps the (%).data.label element of the event data of the rowclick event to the $params.selectedLabel property of MyQuery2. MyQuery2 takes $params.selectedLabel as parameter for the statement in the cypher property. One trigger executes when type:success AND (%).data.destination:NetworkView . This trigger maps (%).processed.nodes and (%).processed.relations to the #nodes and relations properties of the IA_NetworkView MyNetworkView. The other trigger executes when type:success AND (%).data.destination:TableView . This trigger maps (%).data[#].name to #data property of the IA_TableView MyTable2.